After Mandela’s death, remembrance of his struggle against the state oppression of his people reminds us of Bobby Sands, another human rights defender, who fought for the same goals in Ireland. Nelson Mandela’s death on December 5 at the age of 95 resulted in a worldwide outpouring of grief and tribute, confirming that Mandela was respected and beloved as no other political figure or champion of freedom in modern history. In Britain particularly, the political and media establishments outdid themselves in lavishing praise on the man credited with being the inspiration behind his people’s long struggle to bring an end to apartheid in South Africa. Reading these words, it is worth recalling that Mandela’s greatness came as a consequence of his unflinching devotion and commitment to the struggle against the state oppression of his people, during which he had declared at his trial for treason in South Africa in 1964 - prior to spending the next 27 years in prison - that it was a cause for which he was prepared to die. 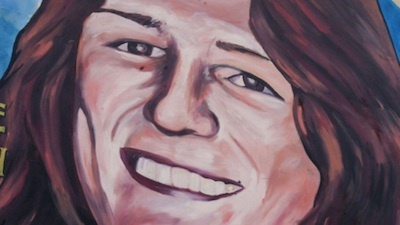 One man who did sacrifice his life for those principles, who resisted British state oppression both in and out of prison and to whom the British establishment not only did not pay tribute upon his death, but still reviles to this day, was Bobby Sands. In 1981, Sands and nine of his comrades embarked on a hunger strike whilst incarcerated by the British state that would inspire not only Nelson Mandela and his comrades being held in Robben Island under apartheid at the time, but millions around the world. By the time of Sands’ death in 1981 the so-called Troubles in the North of Ireland had been raging since the late 1960s, when the Provisional IRA emerged from the failure of successive British governments to reform a sectarian and gerrymandered province, in which the minority Catholic/nationalist population were regarded as second class citizens, denied the same political and civil rights as their Protestant/unionist counterparts. Young ordinary working class Catholics such as Sands were forced to make a choice between acceptance of a status quo under which they and their families were persecuted, intimidated, and forced out of their homes by loyalist mobs backed up by a bigoted police force, or resistance. Sands chose the path of resistance and was arrested and imprisoned twice as a result. Upon his second arrest in 1976 he was interrogated, tortured, and sentenced to 14 years in prison in a trial presided over by three judges with no jury. During his first period of incarceration - 1972 to 1976 - Sands used his time well, immersing himself in books and study groups with his comrades to learn about the history of the Irish liberation struggle, national liberation and anti-colonial struggles throughout the developing world. They also taught themselves the Irish language of Gaelic, which enabled them to communicate amongst one another without being understood by the prison guards. The removal of the political status of Irish republican prisoners had begun in 1976 under the then-Labour government led by James Callaghan. This was timed to tie in with the construction of the new purpose-built Maze Prison just outside Belfast, where both republican and loyalist prisoners were to be transferred from the existing Long Kesh Prison Camp nearby and other detention facilities across the province. Margaret Thatcher and the Tories, replacing Callaghan’s Labour government in 1979, were determined to continue the policy of criminalization of republican prisoners as part of a new offensive against Irish republicanism in general. As determined as Sands and his comrades were to see their hunger strike through to the end, Thatcher was equally determined not to budge one inch from her government’s policy of criminalization. This continued even after Sands was elected as a British Member of Parliament in the midst of his hunger strike in a local by-election, and even in the face of growing international condemnation over the British government’s unwillingness to compromise. When Bobby Sands died the impact was felt around the world. Opposition MPs in the Indian parliament observed a minute’s silence and protest marches were held against the British government and in tribute to Sands and his comrades across the world, from Scandinavia to North America. Following their example, Nelson Mandela led a hunger strike by prisoners on Robben Island to improve their own conditions. In Tehran the name of the street in which the British Embassy was located was changed to Bobby Sands Street, forcing it to relocate its entrance to avoid the embarrassment of Bobby Sands Street appearing on the letterhead of its stationery and official documents. Meanwhile Cuban President Fidel Castro spoke about Sands and his comrades during one of his speeches. “Next to this example, what were the three days of Christ on Calvary as a symbol of human sacrifice down through the centuries?” Castro said. Perhaps the most significant and powerful tribute came in the form of a letter from Palestinian prisoners incarcerated in the Israeli desert prison of Nafha. The letter was smuggled out and reached the Falls Road in West Belfast in July 1981. It read in part, “We, revolutionaries of the Palestinian people who are under the terrorist rule of Zionism, write you this letter from the desert prison of Nafha. “We extend our salutes and solidarity with you in the confrontation against the oppressive terrorist rule enforced upon the Irish people by the British ruling elite. The sacrifice made by Bobby Sands and his comrades in the name of national liberation and anti-colonialism all those years ago remains a testament to the power of the human spirit. Both Nelson Mandela and Bobby Sands struggled for the freedom of their people. A British establishment that now seeks to associate itself with Mandela’s legacy while reviling the legacy of Bobby Sands positively reeks of hypocrisy.